The IRS has released the new-and-improved Form 1040 for your 2018 individual federal income tax return. The good news is the return is now postcard-sized if your tax situation is super-simple. The bad news is probably not – in which case the new Form 1040 is just alarmingly different than before rather than simpler. So if you really have to stop, stop here and get a tax return to prepare your 2018 return. Key Point: The due date for your 2018 Form 1040 is 4/15/19, unless you live in Maine or Massachusetts, in which case your deadline is 17.04.19. You can automatically extend your return to 10/15/19 by filing Form 4868 with the IRS on or before the applicable deadline. Find Form 4868 at www.irs.gov. 040 for 2018, first unveiled last summer, is a two-sided postcard that looks like this. The front page of the postcard is just for informational purposes like your name, address, Social Security number, dependents, and filing status. Your signature also goes on this page. The back page is for numbers (income, deductions, taxes, and credits). It bears a family resemblance to the bottom half of page 1 and page 2 of the old Form 1040. In the simplest situations, you only have to file the base postcard return. More likely, you also have to file one or more of new Schedules 1-6. Even if you only have to file the base postcard return, you can have some worksheets that are included in the Form 1040 instructions. For example, if you claim the new deduction for qualified business income from pass-through entities (sole proprietorships, LLCs, partnerships, and corporations), there's a worksheet to calculate your allowable deduction. You don't file these worksheets with your return, but you should keep them with your tax records for the year. File this if you have the alternative minimum tax (AMT) or have to repay excess advance tax credits that were sent to your health insurance company. File this if you are claiming nonrefundable tax other than the child tax credit or the new $ 500 credit for other dependents. These include the credits for higher education expenses, child and dependent care expenses, adoption expenses, retirement savers, residential energy saving expenditures, electric vehicles and foreign taxes. 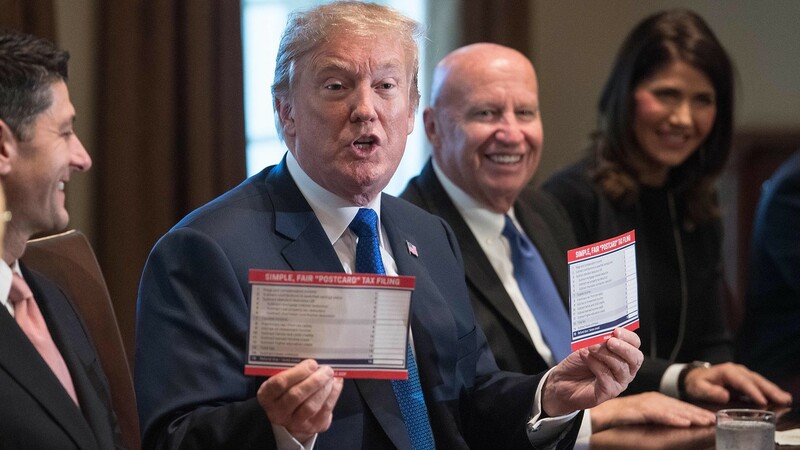 File this if you have other taxes, such as the 10% penalty tax on early retirement account withdrawals, the penalty tax for not having Obamacare-compliant health insurance coverage, the additional 0.9% for Medicare tax on higher earners, or the 3.8% net investment income tax on higher-income individuals. File this if you have tax payments or refundable credits (treated the same as tax payments) that cannot be entered directly on Form 1040. These include quarterly estimated tax payments, the tax payment with an extension request on Form 4868, the Obamacare insurance premium tax credit, and the credit for overpayment of several employers last year. File this if you have a foreign address or want to allow another person (other than your paid preparation) to discuss your return with the IRS. in the past, you may still have to file one or more of the following additional schedules with your base Form 1040. * Schedule A if you itemize deductions. However, many folks won't be itemizing for 2018, because the standard deduction amounts were almost doubled by the Tax Cuts and Jobs Act. For 2018, the standard deductions are $ 12,000 for unmarried individuals, $ 24,000 for married-filing couples, and $ 18,000 for heads of households. * Schedule E if you had royalty income or loss from rental real estate, a partnership, and LLC treated as a partnership for tax purposes, an corporation, or an estate or trust. * Schedule SE if you own the self-employment tax. * Schedule H or you payroll taxes for household employees. As in the past, you may still have one or more additional tax forms with your base 2018 Form 1040. For example, if you owe the AMT, you must file Form 6251. If you have the capital, you must Form 8949 in addition to Schedule D. If you claim the credit for child care expenses, you must file Form 2441. As in the past, the list goes on and one. As with most tax questions, the answer is yes and no. In the simplest situation, taxpayers can now file the postcard-sized base Form 1040 and be done with it. Good for them. These folks may be able to dispense with paid tax preparers. But if your tax situation has any degree of complexity, your 2018 return will not be easier than before. But it will be different. And your paid prepaid may charge more than before. Sorry about that.